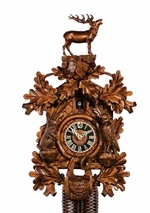 Black Forest German Cuckoo Clock home today! 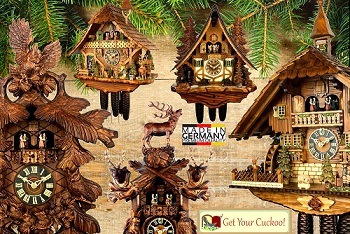 MyCuckooClocks.com searches the world for the finest unique German Cuckoo Clock. Thanks to our product knowledge & experience, we can bring them to you at great prices. A wide range of German Black Forest Cuckoo Clocks of various styles and models, all handcrafted by the greatest horologists in the world. Mixing great style, music, and craftsmanship, the manual cuckoo clock is the embodiment of artisan horology. My Cuckoo Clocks offers a huge selection of modern and antique cuckoo clocks to fit your budget and personal style. We search all over the world for the most unique products with the best value, giving you an array of clocks in numerous types and styles, including, chalet, quartz, musical, one-day, eight-day, and hand-painted cuckoo clocks. We pride ourselves on providing quality products and an excellent experience for our customers. Choose a winding cuckoo clock from our selection of over 500 clocks, and feel free to contact us if you need help.